I guess in my travels I’ve had a chance to figure out what I do and don’t like, and what my body does and does not cope well with and without. I’ve certainly gone through stints where I’ve had to get by on pretty poor diet- certain deployments, for example, where both food choice and food quality were pretty low. They were good times to go through from a learning perspective- but certainly not fun. I don’t enjoy being hungry- especially not when you’ve got a demanding job to do, under difficult circumstances. I can’t pretend to be the world’s healthiest eater. MIO and I are constantly fasting things from our diet (generally, sugar and alcohol) in order to kick-start some healthier habits- and general fitness. So I suppose if I’m going to be marooned on a desert island, this is also going to play a part. Of course, the real question is, what type of island is this? Does it have coconut palms? Can I catch fish? I should be able to get salt from the sea, and maybe some other goodies as well. And what herbs might be growing to add a little flavour, and could I talk my captors into bringing me a few seeds from time to time…? But maybe that’s all cheating. 1. Bread. And I’m going to request fresh bread. Every culture has a staple. I can’t deny my northern European genetic heritage. So it’s either going to be bread, or potatoes. But I do love my daily bread. Growing up in France, I got spoiled having boulangeries on every corner, and cheap, warm, soft bread pretty much on tap. Of course, over the years I’ve found I love breads from most parts of the world- so long as it’s fresh, usually soft, and ideally warm. Flat-breads from the Middle East, or naan from south Asia, or a nice Turkish bread, really, I’m open to variety. In fact, while you’re at it, by all means vary said bread on a daily basis, just to keep in interesting. I don’t mind a weekly rotation. From a dietary perspective, of course, bread is a nice source of carbohydrates, an appetite-killer and a stomach-filler. If I’m stuck on a private island someplace, then I don’t want to be thinking about my hungry stomach all the time. I thought about rice, but rice can be a bit starchy, and doesn’t have the variety that bread does. So, bread it is. 2. Beans. When I lived in northern Papua New Guinea, my housemate and I would shop for all our food needs at the local market. It was a grubby but vibrant place, with a beautiful range of fresh- and I mean fresh- fruit and vegetables. We’d stock up once a week for about $20, and would generally cook curries for ourselves, with lashings of hot sauce, curry powder and other spices and flavours in there. I’m no vegetarian, but we’d generally only have meat once a week, sometimes less, and I’d say that that period was one of the healthiest, from a dietary perspective, I’ve ever enjoyed. I’ve never really been a fan of beans. But in PNG we’d buy great bunches of snake beans for a pittance, and they’d become a mainstay of the curry. Beans are greens (again, never been big on greens) so chocked full of nutritional goodness, and I reckon they’d be a good option in terms of maintaining the healthy side of things. Not my favourite foodstuff, but if I’m stuck on an island, I don’t want to be getting sick or scurvied. 3. Lentils. I love Indian food. Again, I enjoy a blend of international cuisine, and done well, Thai blows me away for the subtle aromatic nature of it. But the sheer variety and tastiness of Indian cuisine delights me non-stop. Hence I’ve garnered a love for lentils (encouraged by my wife, who also loves them and cooks some very tasty lentil dishes). As a pulse, lentils are full of protein (seeing as I’m not asking for meat)- and another good one for filling you up, but filling you up with stuff that’s really healthy. While I realise that my captors may not be providing me with a spice rack (if they did, we’re home and dry), at least if I’ve got to eat blandly, let’s get the right building-blocks into the system. 4. Tomatoes. Another mainstay of stews and curries, tomatoes in cooking add so much flavour. As a fruit they’ve got some good nutritional value (sure, I want to limit my risk of prostate cancer). But I reckon, cooked with beans and lentils, you’ve actually started to get yourself a stew with some flavour and nutritional goodness. Now, I’m not about to tell you that’s all I want to eat for the next 50 years. But, look, I reckon if I did, I wouldn’t come away too unhealthy. At least that’d be my hope. 5. Cheese. I nearly put Vegemite here. After all, I have to stay true to my Kiwi roots (okay, fine, Sanitarium Marmite, but Vegemite would still be my choice). It’s a little spread of home, that nice salty blast really wakes up the mouth, and you could even use it as a food additive to bring some additional flavour. To this day I travel with a tub of Vegemite on longer assignments- one of my comfort foods. And it helps make even stale bread taste a little better (yes, learned from experience). I also tossed around peanut butter for similar reasons- and also because it would help the sugar cravings. However. Cheese. There are few things I enjoy more than cheese, in pretty much any of its forms. I love the variety (again, I hope my captors will be acquiescent here)- from nice bitey mature hard cheeses to rich soft stinky gooey ones, I’m pretty open to a gamut of them things. Dairy’s a nice balance to the above smattering of food groups- gotta keep my bones strong. It’s a total comfort food for me. And, it’s one of those universal savoury foods- meaning, it goes with pretty much anything. Also, if I played my cards right, with bread and cheese I’ve got the starting of a cheese fondue. Just got to bargain my way to a little garlic and a sloosh of kirsch. And that is something I could eat from here to eternity. 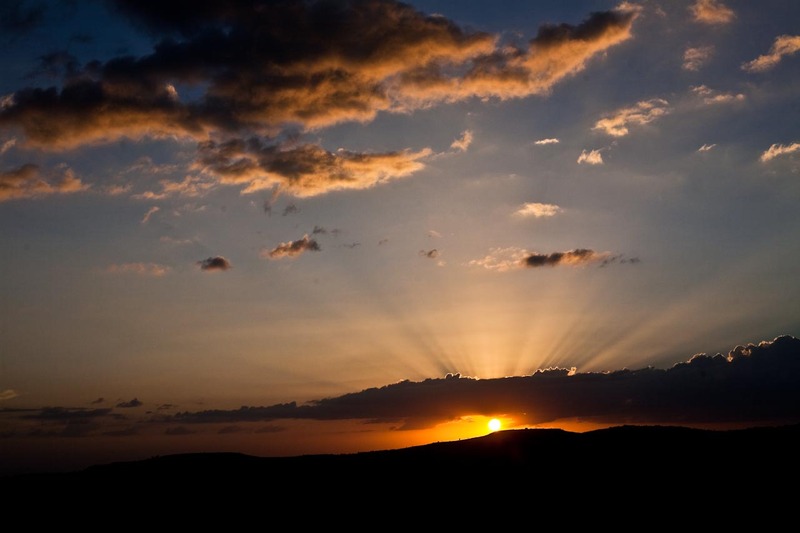 It’s hard to overstate Ethiopia as a travel destination. It has fascinating and unique history and culture, sites to visit and activities to do, a combination of anthropological and wild natural beauty- in short, all the things you would look for, from a range of travel backgrounds. In addition, Ethiopian Airlines has a safe, wide-reaching and very economical domestic network making it easy to get from place to place. The cost of food, accomodation and activities are all very low, the country is safe and stable (with the exception of some border regions), and the Ethiopian peoples are, as a rule, gentle and friendly. And finally, while there is a significant tourism business here, the place is not overrun by ferengi, so you don’t need to feel like you’re part of a giant guided tour. 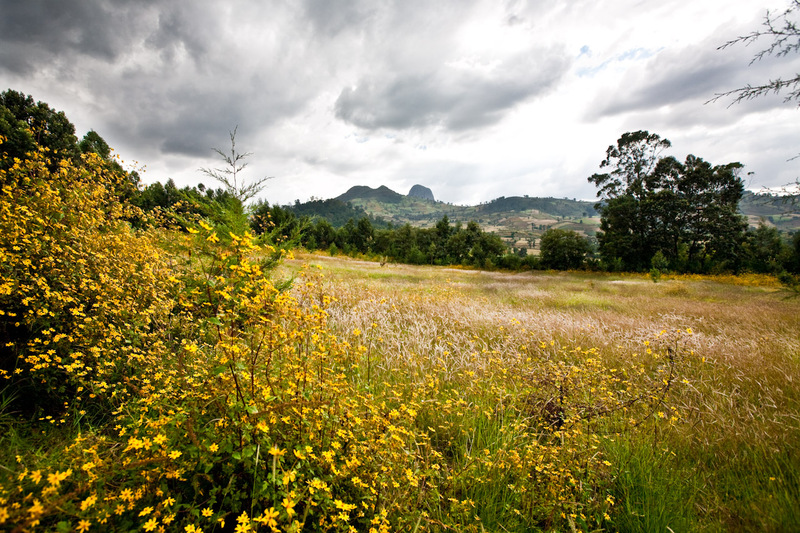 If that doesn’t entice you to come for a visit, let me give you a short and very non-exhaustive list of things you can do in Amhara Region, one of the more popular travel destinations. Note: I’ve generally quoted prices in Birr. The exchange rate is roughly USD 1: ETB 18. 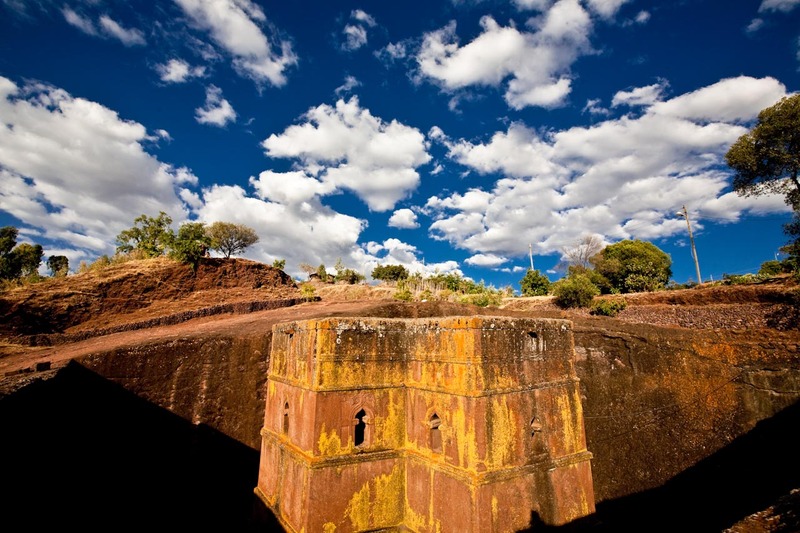 The rock-hewn churches of Lalibela, UNESCO World Heritage listed, are possibly Ethiopia’s most famous tourist draw- and unsurprisingly-so. 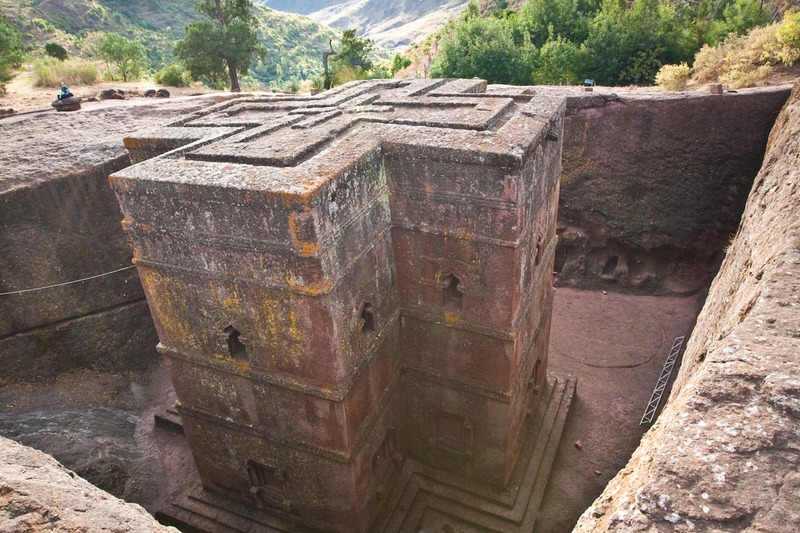 While the most famous of these- the cross-shaped Bete Giorgis (St George’s Church), sometimes refered to as the 8th Wonder of the World- features prominently in photographs, there are in fact a constellation of structure scattered around this small mountain village. The main dozen-or-so churches are clustered in three groups, all within easy walk of one another, carved into trenches out of the solid rock itself rather than constructed using bricks or blocks. 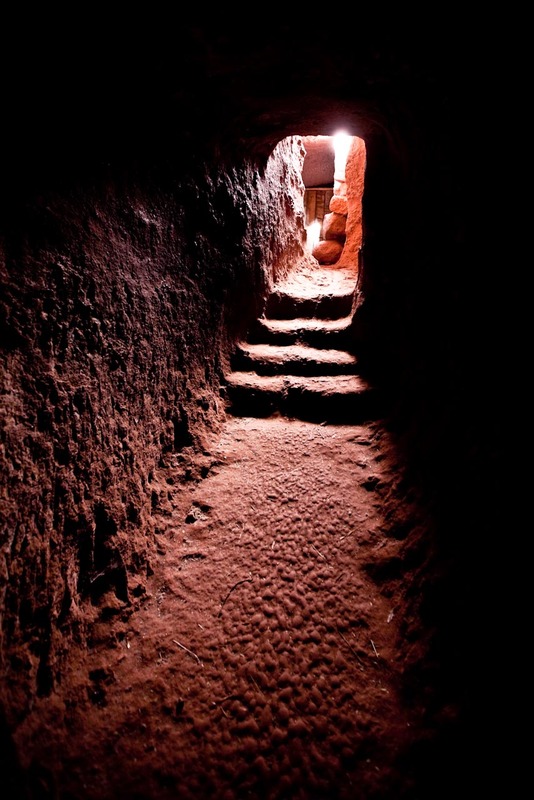 They are connected by tunnels and passageways, worn by centuries of use (the churches are active to this day). 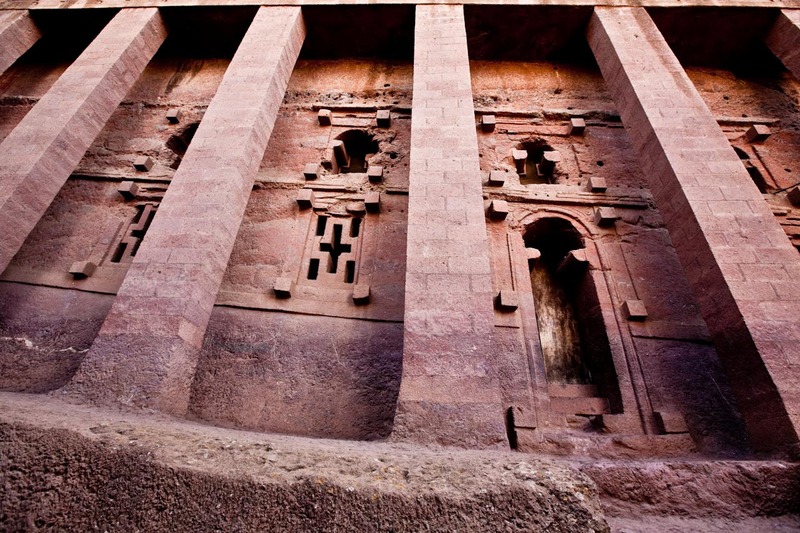 The churches themselves- St. Lalibela is said to have built the town and its icons around his memories of Jerusalem from time spent there in his youth- are tall and blocky, I suspect reminiscent of the Jewish Temple/Tarbernacle. In the Orthodox style, they have an outer area for the congregation, and then an inner sanctuary like the Holy Place, concealed behind a thick curtain, into which only priests can enter. Flash photography is forbidden, and shoes must be removed at the door. The insides are furnished with rugs and icons, dimly lit, some distinctly cavernous in mood. The Lalibela churches, built in the 12th & 13th centuries, rate right up there with the most interesting and enjoyable archeological sites I’ve ever visited- right on a par with somewhere like Angkor Wat. 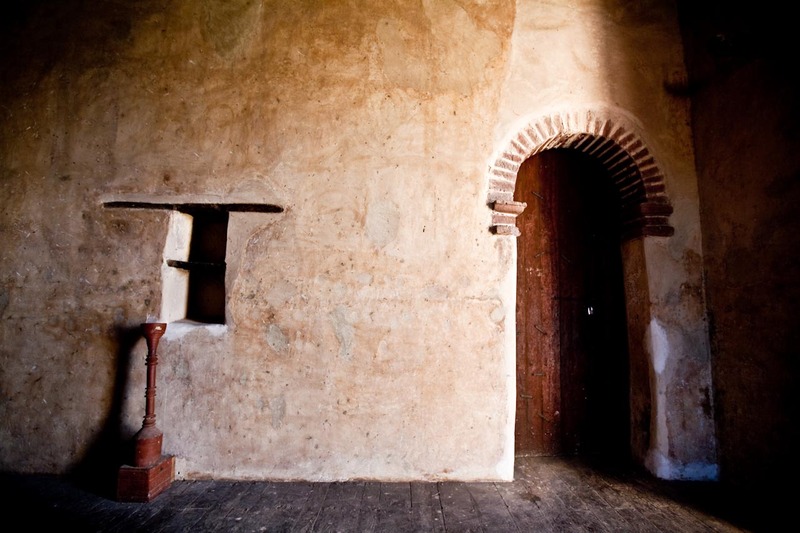 Exploring the churches and passageways is a hoot, and in style true to the continent, there are no ropes or overly-cautious shepherding of visitors through set passageways. 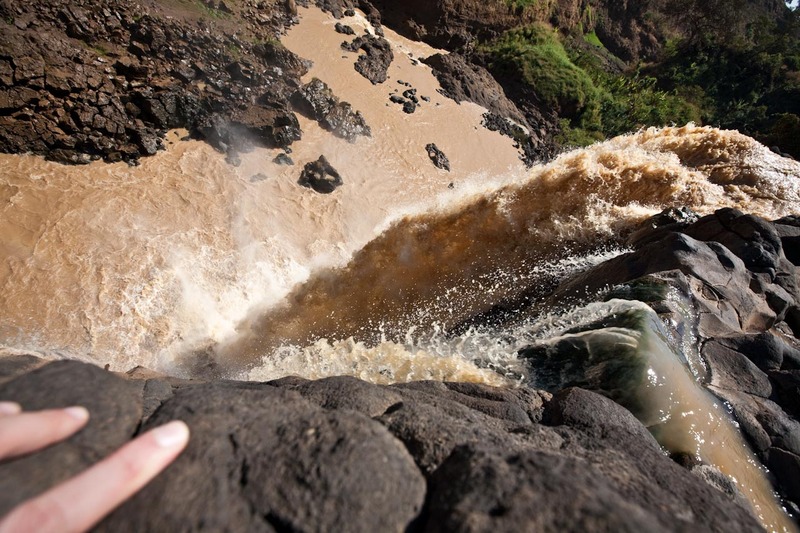 If you want to plunge to your death over a 50-foot rocky ledge, that’s your own dumb fault. We spent an afternoon and saw perhaps half the churches, but it was a rush job. I’d recommend you block out two days to take your time, explore the nooks and crannies, and really soak in the otherworldly atmosphere of this interesting place. Lalibela village is probably the most touristed of Ethiopian locales, and because of its small size and big draw, it’s the one place in Ethiopia where you’re likely to trip over other foreigners. The kids will strike up conversation in any of the major tourist languages- I tried English, French and Spanish, and I suspect Italian and Russian are on the menu too- and will try the usual ways to get you to give them money- ask for foreign coins (we’re collecting coins for a school project), ask for footballs (we had a football team but the ball burst so now we can’t play), invite you home for coffee, or offer to guide you into the hills to see another church. They are harmless, and if you politely tell them to leave you alone (assuming you don’t want the banter, which can be entertaining), they generally will. You can reach Lalibela by road, but most people fly in- there are a couple of flights daily to and from Addis, doing a loop via Gondar and Aksum. Shared minivans cost a set 70 Birr one-way for the 30-minute ride between the airport and the village, which is perched on a shoulder at around 2,500m above the valley. The ride is visually spectacular, as are the views from the village. A pass to visit all the churches costs 350 Birr and lasts for several days- you buy it at the tourist booth as you head into the first of the church complexes. You will be asked for it regularly, and if you get a pass with several friends, you’ll need to stay together (as I found out to my frustration). Guides are on offer and are entirely up to personal preference. The complex is self-explanatory and fun to explore alone, and we didn’t bother. There is plenty of material available online on the history of the churches, but if you want somebody to take you round and tell you stuff, that works too. Note that guides are of varying quality- and may spin things that aren’t true. The Seven Olives Hotel, on the main road, has pleasant leafy gardens and a terrace overlooking the valley, and makes a lovely spot to have lunch. The Mountain View and the newer Cliff Edge Hotels have dramatic views from their exposed locations, the former with one of the towns better options for dinner. Consider booking, as it can get full during peak times. 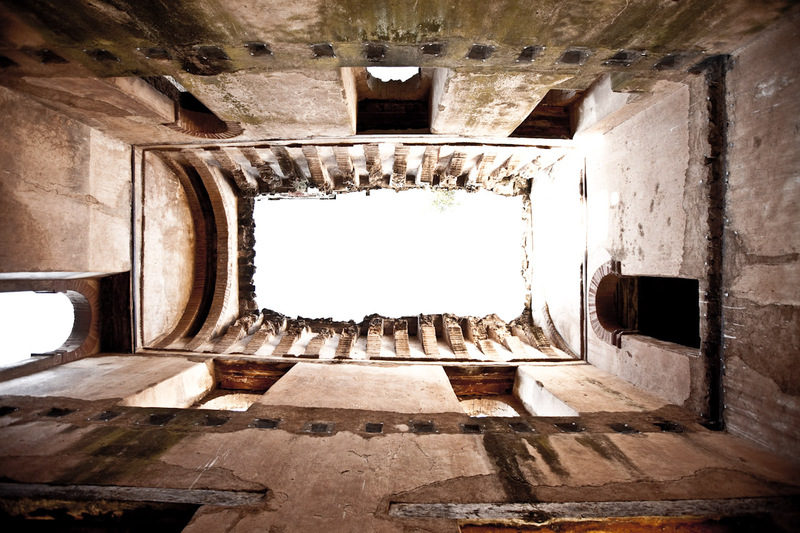 When King Fasilides made Gondar the seat of his empire in the 1600s, he constructed a palace that would eventually sprawl into a large complex, as children and grandchildren added their own buildings to the compound. 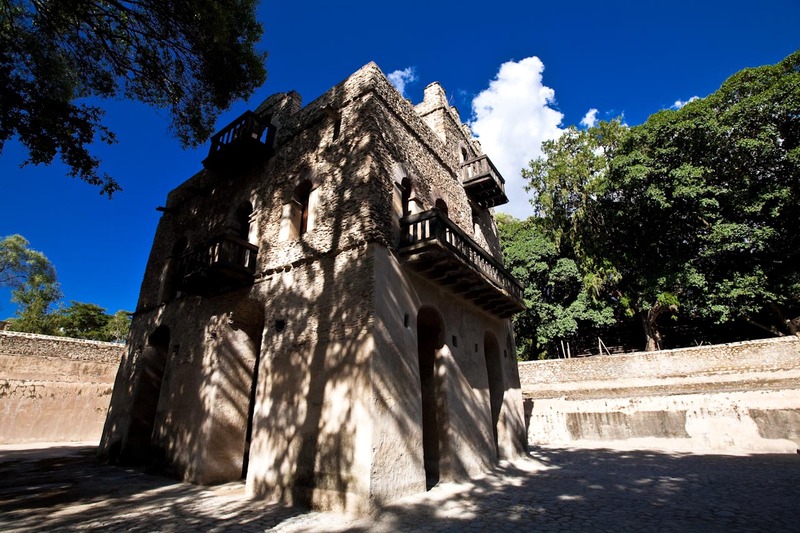 Set in the heart of what is now one of Ethiopia’s largest cities (still fairly small at around a quarter of a million people), the palace complex is a mixture of beautifully-preserved period architecture with European and Moorish influences, and rambling ruins. Interestingly, Fasilides’ Castle itself is the best-preserved, and you can wander through its lower halls and explore its nooks and pockets. 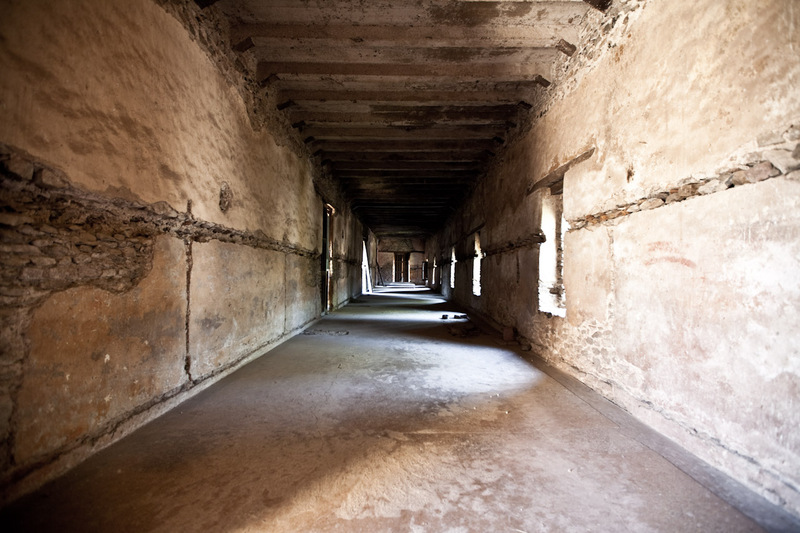 Elsewhere are reservoirs and steam-baths, the remains of kitchens and stables, even the enclosures for leopards and lions that used to grace the grounds. The place has a ramshackle feel in many ways, the buildings a little haphazard in their placing, but it makes for a great afternoon’s exploring. 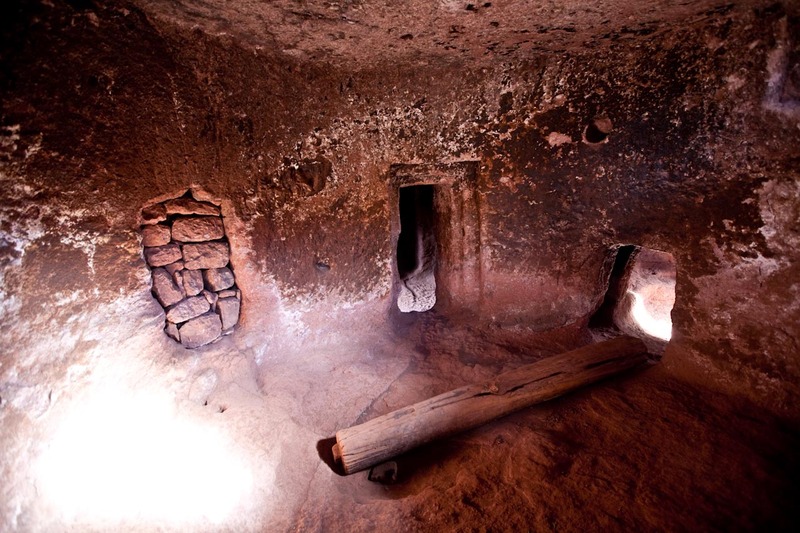 As with Lalibela, guides are on offer (for a fee) but entirely optional. It’s fun and freeing just to explore by yourself, although again, if getting historical explanation is part and parcel of the experience for you, go for it. Entrance costs 100 Birr for a tourist, and will also give access to Fasilides’ baths, a ceremonial complex a five minute bajaj (tuk-tuk) ride away. The Castle sits by the Town Centre, where buses and taxis both drop off, and is hard to miss. The Goha Hotel sits on top of a hill overlooking the town itself, and is a grand place to enjoy dinner and a drink (ideally a Daschen Beer, as their Brewery is in Gondar, so the stuff is fresh). I can’t comment on the rooms, but it looks like one of the town’s better hotels. There are plenty of cheaper options. 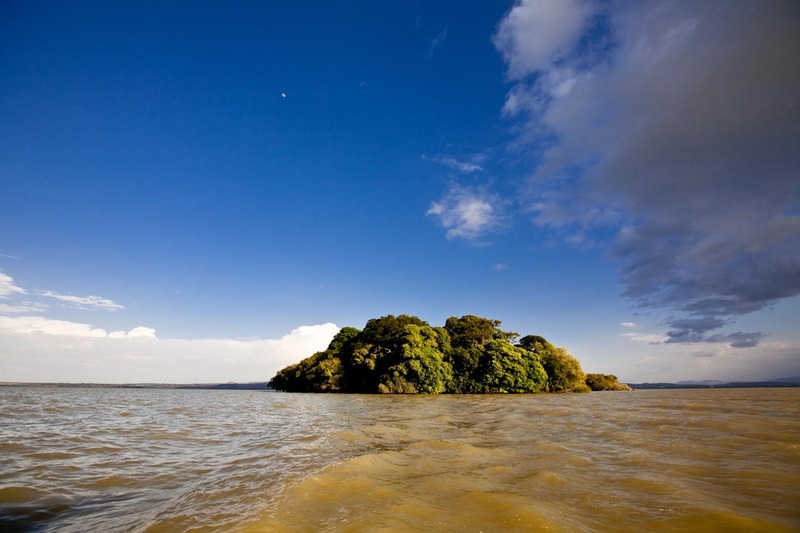 The Blue Nile- the shorter but higher-volume tributary of the Nile River vis-a-vis its chromatic counterpart, the White Nile- flows out of Lake Tana just a few kilometres north of Amhara’s administrative capital Bahir Dar. From there it flows thirty or forty kilometres eastward, and tumbles over a precipice. Its flow split between a hydro-electric power-station and the falls themselves, the flow over the falls can vary depending on season and the functioning of the power station, from not much more than a trickle, to a thundering wall of water 400m wide and up to 45m high. I’ve seen the falls twice- once with the power-station turned off and water diverted over the waterfall, and once with lower flow. Both times were visually dramatic. The water spouts over and throws up a steady mist, creating swirling winds that gust over the little plateau at the falls’ base. A winding canyon is carved into the hillscape below the falls, and another narrow stream joins as well, over which is hung a suspension footbridge. It’s possible to walk almost to the base of the falls (although the mist makes it hard to take photos without spotting your lens), and it’s also possible to walk around to the very top of the falls (see earlier comment about lack of ropes and plunging to death). The view leaning out over the rock ledge above the cascading brown water is quite spectacular. 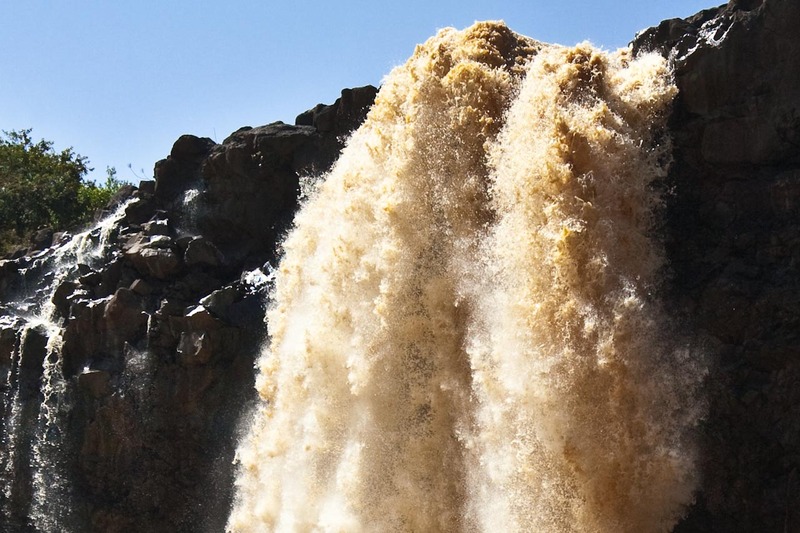 When the water level is low, it’s also kind of fun walking in the ‘bed’ of the Nile to check out the falls. 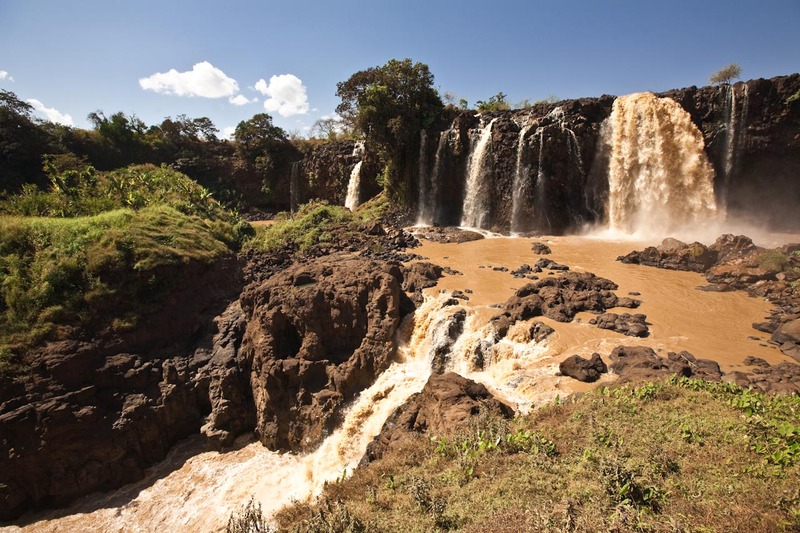 It’s about a 45 minute picturesque car journey through open farmland from Bahir Dar to the falls- known locally as Tis Abay (Abay being the Amharic name for the Blue Nile). There is public transport (minivans), or alternatively, you can negotiate a hotel shuttle- we were quoted 800 Birr. Bajajs would struggle with the gravel road, and would probably take about 3 hours each way for the journey, so don’t try that option. In the small village of Tissisat, you pay an entrance fee (around 70 Birr, if I remember), then walk or drive to the river crossing about 500m upstream. A motor launch shuttles you across the channel for 10 Birr each way per person, and then it’s a 15 minute walk through gentle countryside to the site of the falls themselves. Children sell scarves and drinks at the top, but are generally good-natured and easily dissuaded. There’s a second approach to the falls which involves a four-hour walk through local villages, coming up on the cascade from the other direction, which sounds like an enjoyable trip to make. I’d love to see the falls in flood, as I suspect it would be an awesome sight. 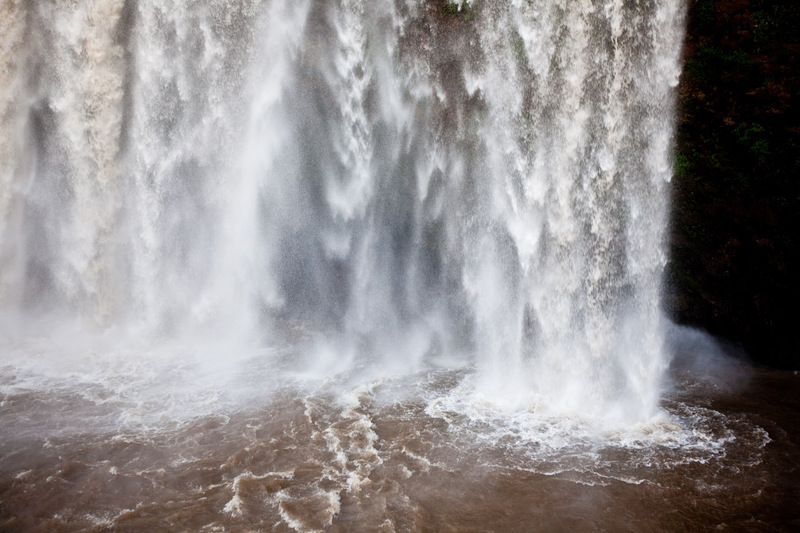 None the less, the Blue Nile Falls should be a must-see on any Amharic agenda if you’re in Bahir Dar. 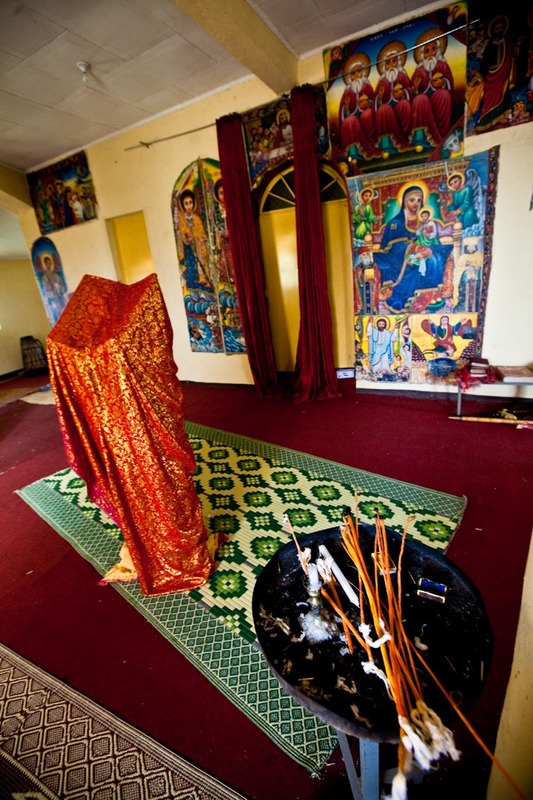 There are some sixty-odd Orthodox monasteries, apparently, scattered around Lake Tana. 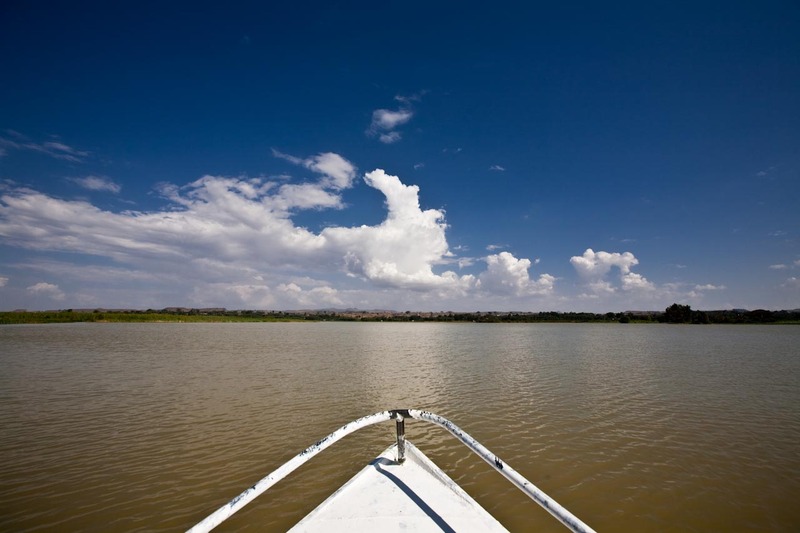 The Lake is Ethiopia’s biggest, source of the Blue Nile, and stretches northwards from Bahir Dar. The monasteries are situated around the lake’s edge, and on a number of small islets that dot the waters. And they’re open for business. 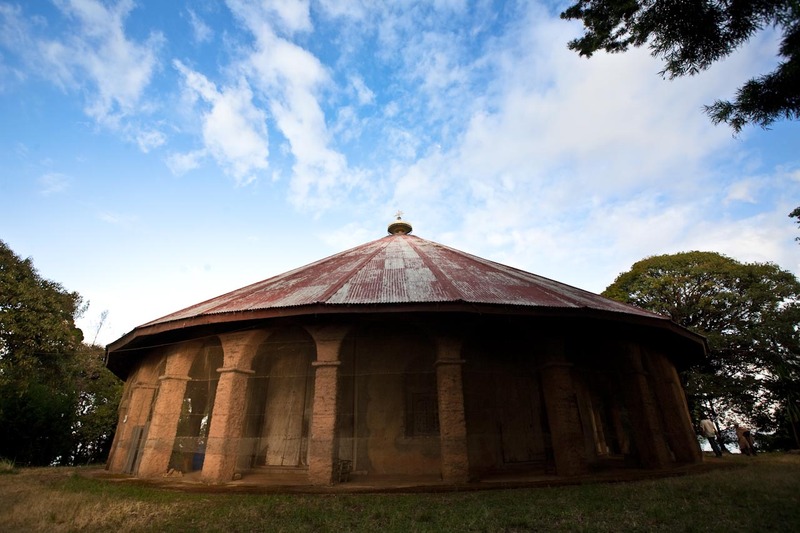 Checking out Lake Tana’s monasteries is one of the more unique things you can do in Ethiopia. I guess the idea behind any real monastery is an element of isolation or seclusion, but short of the needle-top monasteries of Meteora, in Greece, these guys really seem to be ahead of the curve. Started seven hundred years ago, these isolated little pockets of meditation are really worth checking out. We visited three monasteries (all we had time for in a single afternoon). The first was at the mouth of the Nile, on what was said to be an island (though could also have been a little peninsula), surrounded by papyrus reeds, with a small village and an assortment of fruit trees to keep it company. The church at the heart of the complex was typical Orthodox style, a round shell with roof made from bamboo and leather strapping. The other two we visited were far more isolated, out in the centre of the shallow lake (Tana never gets deeper than 9m) on hilly little islets a couple of hundred metres across, if that. The sense of isolation was tangible, the natural beauty striking. It’d be hard to come up with a more idyllic place to spend ten years of your life meditating on scripture, if that’s your thing. Getting out to the monasteries, you can hire a launch and driver from the lake’s edge in Bahir Dar. Rates vary by number of passengers, number of monasteries, and time. Three pax, three monastaries, and a good four hours or more on the water cost us about 700 Birr for the boat and driver. I’m sure that rate could be brought down with some good bargaining. Once you reach the islands, there is also an entry fee of 100 Birr per monastery. We hired a guide at the first stop (not knowing the protocol) for about 150 Birr, found him to be useless and factually vague, and also noted that after that first stop, there were no more guides available, so really, I wouldn’t recommend getting a guide. 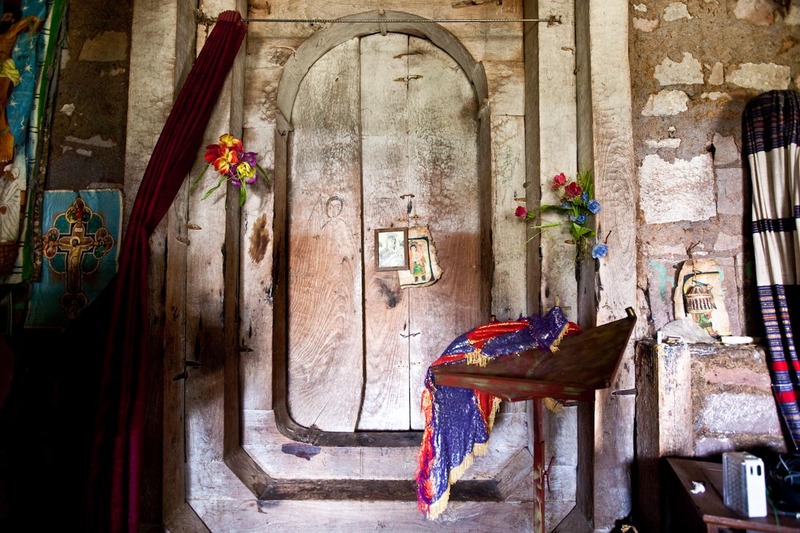 The two things worth noting: First, take your shoes off before entering the churches, and second, the inner sanctuary is holy, and non-Priests cannot enter, so don’t. All up, factoring in driver, boat and entry fees, by Ethiopian standards, it’s a pretty pricey day. As much as the islands themselves, the journey is a big part of the fun, and we enjoyed lounging on our little boat in the choppy afternoon winds, chatting, dozing and enjoying the sunshine. It’s a relaxed, slow-paced and memorable half-day trip, highly recommended. Ethiopia’s domestic airways can be a bit of a shuttle-run, with short hops between multiple towns en route to your destination, and I was initially disappointed to find that our jump from Gondar to Lalibela- a very short flight in a straight line- first went via Aksum, almost on the Eritrean border. Each leg of the flight in the 80-seater Bombardier Q400 lasted just over 30 minutes. And the scenery was epic. 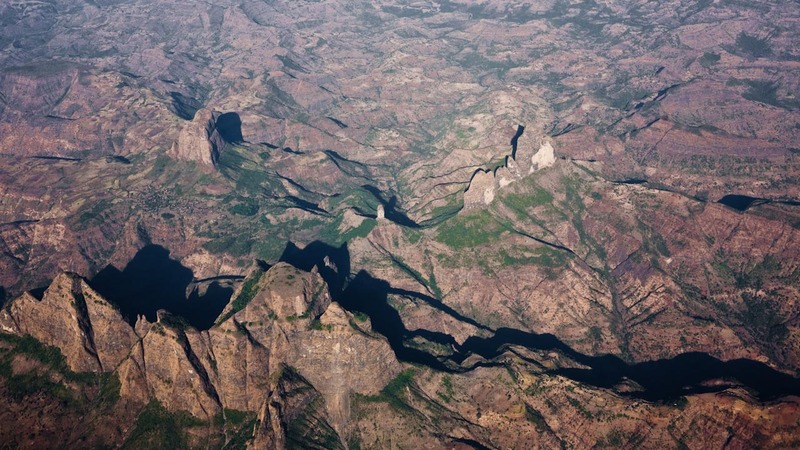 The flight takes you over the top of the Simien Mountains, to the north of Gondar. The mountains are sheer, craggy, riven by improbably deep valleys and split by rock walls that rise giddyingly out of the shadows. 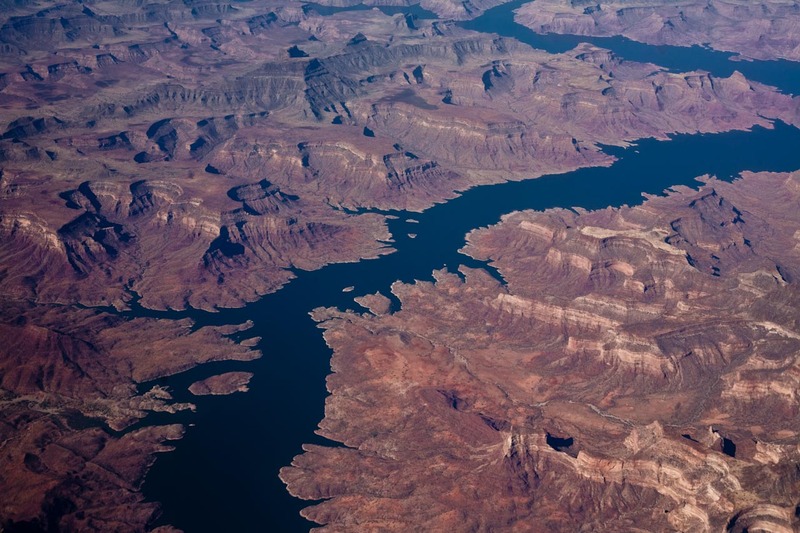 They’re a breathtaking view, and I spent the flight with my face glued to the window. Approaching Aksum, the scenery is a dry patchwork of terraces and smallholdings set against a jagged horizon, also eye-popping. The leg from there South-East towards Lalibella skirts further to the east of the Simiens (still very visible as you fly past), and then the terrain breaks into a vast jumble of flat-topped hills and steep gullies, almost uninhabited and truly some of the wildest, most inaccessible landscape you can picture. Once clearly an upland plateau and now eroded by eons of flowing water, it’s a scene that leaves itself burned on your memory. 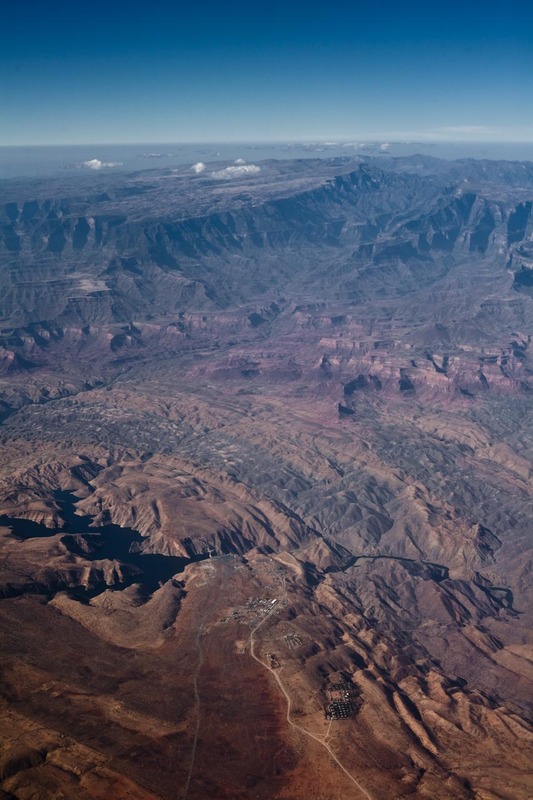 The plane flies at around 20,000 feet, but given that the landscape is already up at around 8-10,000 feet in places, it means you’re not so far off the ground, and at this time of year, the sky is cloudless. Sitting on the right-hand side of the plane (seat L) and far forward or far back gives the best view. I recommend 11L, which is right at the front on the right, and by good fortune was what I was given without realising the treat that was in store. None the less, despite being just a part of the travel process, the two flight legs became one of the strongest memories of that particular trip. 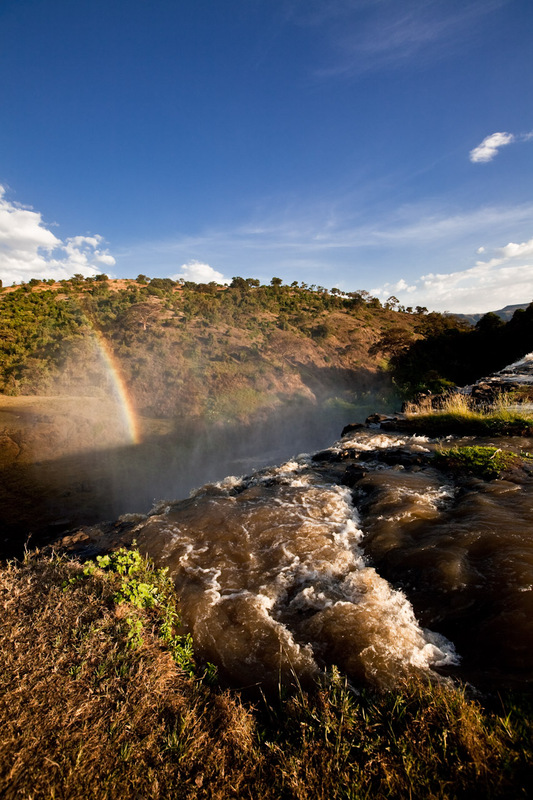 From a cost perspective, the itinerary Addis Ababa-Bahir Dar, then Gondar-Lalibela-Addis Ababa, came to a total of $160. 1. Public transportation has a fixed price. While taxis and bajajs will try and fleece you (and, given how cheap everything else is in Ethiopia, boy are they pricey), there’s usually a fixed cost for minivans that doesn’t require bartering, and doesn’t change between locals and ferengi. It’s worth finding out this price ahead of time, on the offchance that you do meet an unscrupulous tout on a minivan or some-such. The prices are generally pretty cheap for intercity travel. The 3-hour journey from Bahir Dar to Gondar costs 65 Birr ($3.60). The van from Lalibela airport to Lalibela town, by contrast, was 70 Birr for a half-hour trip- captive market. As a footnote, do bear in mind that the intercity minivans are a fairly unsafe form of travel- they roll and crash regularly, with high fatality rates. 2. Bring toilet paper. This one’s a no-brainer for anybody who’s travelled in the third world. But trust me, Ethiopia’s one of the worst offenders when it comes to disgruntled bowels- some combination of a relatively poor country, and high altitude (meaning water doesn’t necessarily sterilized when boiled due to the fact that water boils at a lower temperature at altitude; it’s the same reason so many people get sick in Nepal). I haven’t yet met anyone who’s spent any significant time out here and not had a bout of gastro of one form or another (myself included), and some of it’s nasty. While higher quality hotels will probably have toilet paper, cheaper places won’t (and practice your squat for the latrines). Of course, at the risk of going the TMI route, it should be pointed out that if you find yourself on round six or seven for the night cleaning yourself, some water and your left hand is far more soothing to tender areas than another scrape of dry paper. Just wash well. 3. Local ID gets cheaper rates. Often. Not always. But if you’re lucky enough to be in posession of a residency permit, even a temporary one, hotels will often discount room-rates (not as much as for an Ethiopian, but it’s a start), and you can also enter some tourist facilities at a reduced rate too. 4. Beware the cultural restaurant. Ethiopian dancing is pretty amazing stuff. And the music is interesting too. I really do recommend checking out one of the high-quality cultural restaurants in Addis Ababa- some place like Yod Abyssinia just off TeleBole Rd, for example. The dancers are energetic and skillful, and though the music is about 40dB too loud, it’s an unforgettable experience. Unfortunately, there is an assumption that a tourist in Ethiopia must want to be serenaded in this fashion every time they eat. At restaurants frequented by ferengi, expect to find traditional performers, many of whom can be quite lacklustre, and whose musical escapades will leave your ears ringing. It makes conversation very difficult. They usually hit around the 6.30-8pm mark, so eating early or late can mitigate this particular travel hassle which, I’d have to say, our little posse found far more intrusive to our holiday pleasure than the kids approaching us for conversation and money. 5. Warm clothes/layers. At this time of year (December), Ethiopia’s pretty chilly. And by that I mean cold. At night time anyway. Days can be deceptively warm. The air is still and the sun bright, and you’ll want to be in short sleeves (with sunscreen) or thinly covered (as dress standards may dictate in places like monastaries). But within half an hour of sunset, you can expect the air to have a real bite. Most of these places are well above 2,000m (6,000ft) and this might be Africa, and not far off the equator, but it’s downright frigid at night time. As I mentioned at the start of this post, Ethiopia is pretty cheap, especially compared to the rest of Africa. To give you an idea, if you eat at western-style restaurants, unless you’re staying in a spa resort, you can expect to pay well less than 100 Birr ($5.50) for a main, and no more than 30 Birr ($1.65) for a beer or soft-drink (imported wine is more expensive- 400-800 Birr ($22-44) for a bottle of South African, for example). Eating at restaurant targeting local Ethiopians, you can get away with a total meal cost of less than 40 Birr ($2.20), including soft drink (though you do need to watch food hygeine if your constitution isn’t bomb-proof). Three of us regularly ate at nice hotel-restaurants and generally paid less than 300 Birr ($16.65) for the full tab- and we weren’t trying to keep the cost down in the slightest. Hotels vary with quality. Staying at a local pension, a small room with a toilet might go for under 200 Birr ($11) a night, a room without a toilet 150 Birr ($8.30) or less (I have paid 70 Birr- $3.80- for one such). At the better end, you can get a decent, clean and moderately-well appointed room (3-star standard in a good location) for 6-800 Birr ($33-44) in one of the better quality hotels in any of these places. 1. 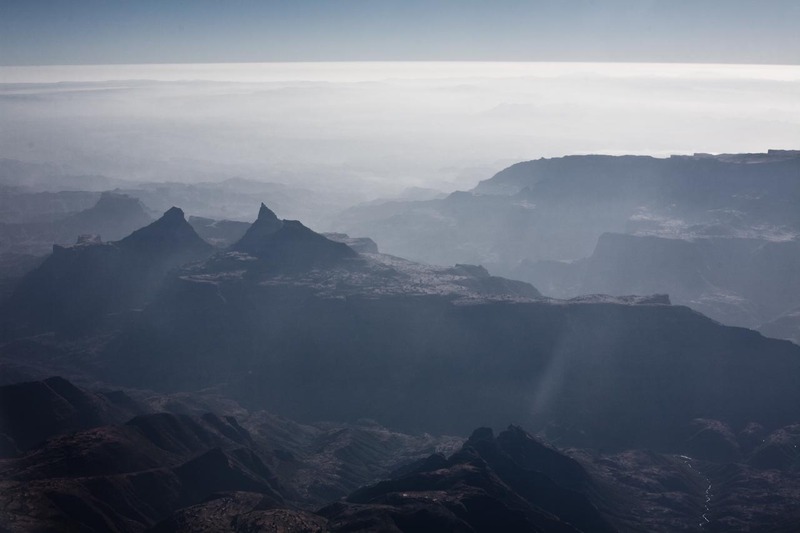 Hike the Simien Mountains. From what people say, this is the thing to do in Ethiopia- possibly alongside the Lalibela churches. The scenery is apparently breathtaking (I can believe it, from what I saw from the air), and everybody who has done it has raved about it. 2. Hike the Lalibela area. There are apparently walks in the hills, as well as churches away from the town itself. 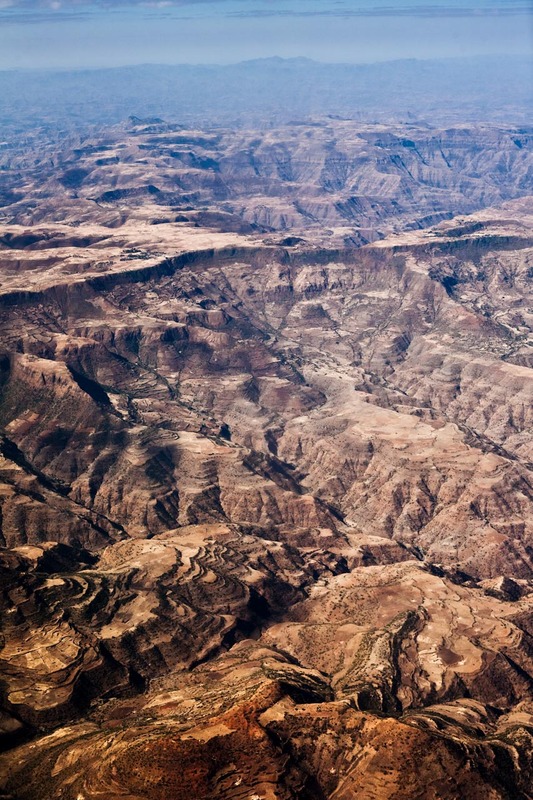 The landscape around Lalibela is rugged and beautiful, and they say it also greens up during the rainy season. I’m keen to try this out. 3. Aksum. This isn’t technically Amhara- it’s in Tigray Region- but it’s easily accessible from Gondar and the Simiens find themselves halfway between Gondar and Aksum. There’s supposedly more UNESCO World Heritage goodness with the remnants of the ancient Aksumite Kingdom, and the landscape makes me want to check it out. 4. 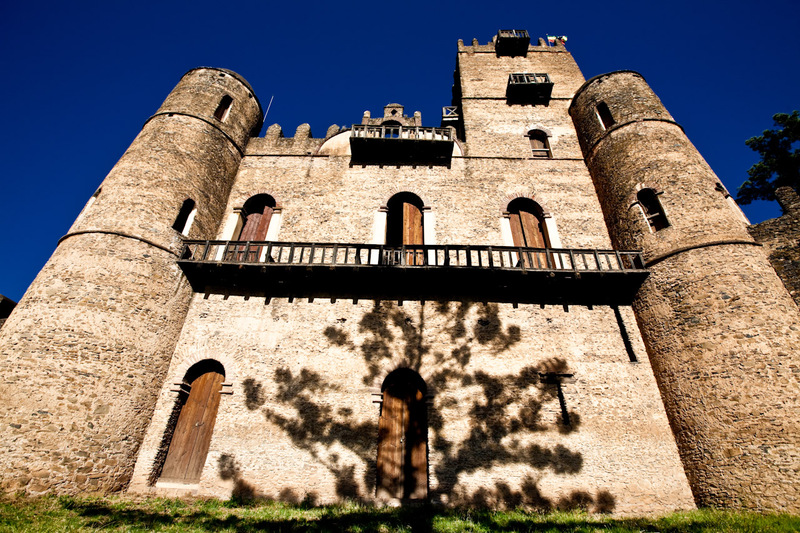 Gondar Area Castles. 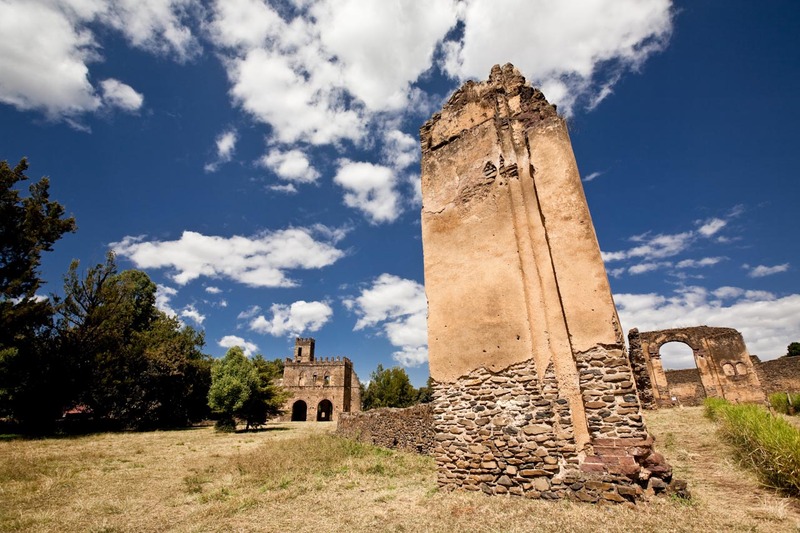 As well as Fasilides and his mob, I understand there are more old castles, forts and/or churches in the Gondar area. The terrain is just beautiful round there as well, so it would be well worth an explore over a couple of days. 5. Explore the Southern Hinterlands. South of Bahir Dar, there’s not much by way of tourist infrastructure, but I was lucky enough to drive through it on field visits. The landscape is lush and dramatic, and it would be a fantastic place to spend several days idling through, taking photos, and soaking in the slow pace. The last time I wrote about Paradise, I was being more than a little ironic. PNG was far from my idea of a good time- however pretty the pictures look. The post was hard, I struggled with the culture and the professional isolation, and for all the good diving and some of the good folks I spent time out there with, it was still a relief to move on to a different stage in my personal and professional life. I went to Fiji in July. It was my fourth trip to the little island nation. I went once for a family holiday in 2001, followed by a couple of work trips in 2008 and earlier this year, and this latest trip was a combination work-play. The first two weeks were to be spent helping manage an interagency disaster simulation for NGO staff in the Pacific across half a dozen agencies, as well as Fijian government representatives. The third week I was to be joined by my [now] fiancee for a bit of relaxation on a small island. 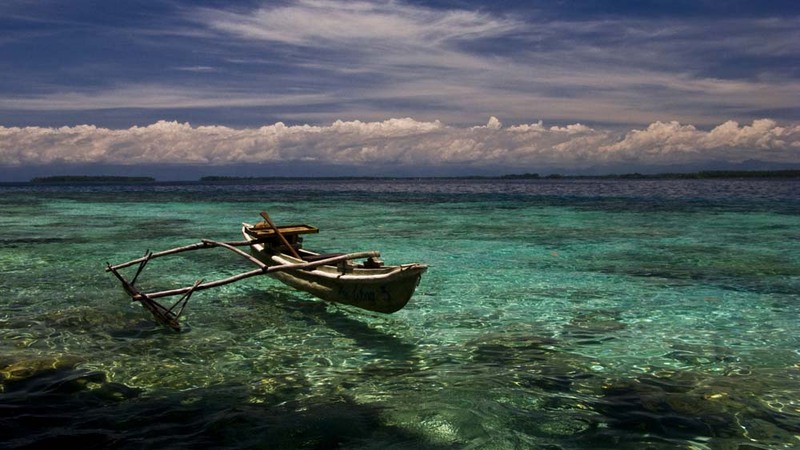 I’ve always figured Fiji for a nice enough place, without being really special. It’s a bit synonymous with package holidays and honeymoons, a sort of upmarket Bali with fancy hotels belying a fragile national economy. We booked into a resort hotel based on input from TripAdvisor, and despite the glowing reviews I was a little dubious. The idea of packaged meals and a resort-style trip (something I’m not at all familiar with) left me a little uneasy. Besides, I’ve been to a lot of places. Over 50 countries worldwide. A whole bunch of beautiful beaches and coastal holiday areas- Cairns, Noosa and Sydney in Australia, dozens of places in New Zealand, Papua New Guinea, Vanuatu, the Solomon Islands, Thailand, Sri Lanka, Haiti, Hawaii, Tahiti and Mombasa- to name an incomplete list. I’ve snorkelled or dived in most of those places, swum and relaxed or sunbathed (to some extent) in all. So when I say that the Blue Lagoon Resort in Nacula is as close to beach paradise as I’ve come across, I know what I’m talking about. Where to start? I’m a bit overwhelmed really. Well, first off, an overview. A brand-new resort, Blue Lagoon pitches itself as a mid-range option to independent travelers that suits budgets of better-off backpackers and flashpackers and young families. It’s quite boutiquey- probably around sixty guests at any one time- and it’s a ways out there too- some four and a half hours’ boat ride from Nadi, and at the top end of the Yasawa group of Islands off Vitu Levu’s west coast. Nacula is a decent-sized island about 10km long and maybe 2-3 wide at its widest. The resort is situated on a beach shared with one other low-key resort on the west side of the island, giving it stunning views at dusk as the sun sets over the Pacific. And the beach is the one you’d create if you had a drawing board and 10 million years of geological time at your disposal. 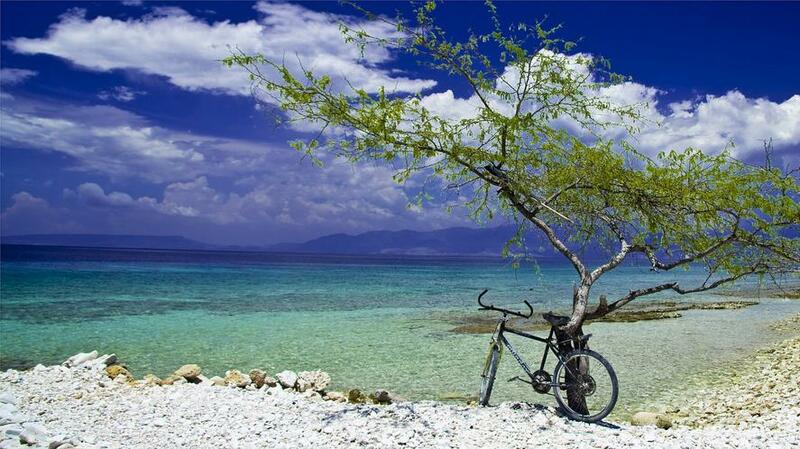 It’s an arc of white sand sloping from a green verge into a turquoise lagoon of calm warm sea. The lagoon itself slides away on a shallow gradient where a natural channel has formed through the coral reef, while small waves lick quietly at the shoreline. More on the reef presently. I’d heard nice things about the resort, but had a feeling that, based on the slightly backpacker-ish pitch of some of the material I’d read (they have a backpackers dorm as an accomodation option) I was concerned that maybe the rooms would be a little pokey. I’d settled myself with the thought that even if the rooms were a bit small and/or run-down, the main attraction was being out and about on the beach, so I steeled myself for the worst. The rooms are delightful. We booked a Delux Garden View room, set back a row from the beach among lush and flowery growth, riddled by sandy footpaths. 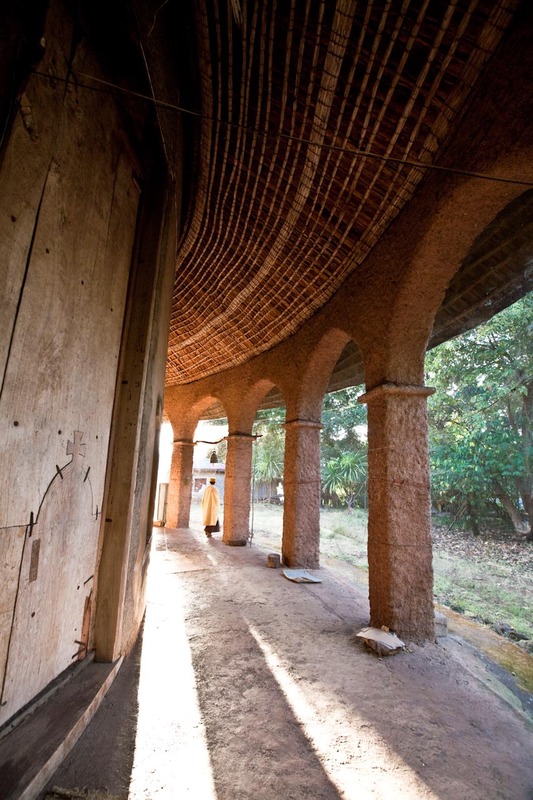 Stepping inside, the bure was large and spacious, with a high open ceiling, fan, wooden slat-blinds that allowed free-flow of air, and an open-air bathroom with magnificent shower. It was clean, new, well-built, and smacked of simple quality. It was light. It was airy. And sitting on the foot of the bed, you could look straight out of the front door and (despite not being an sea-view room) see the irridescent aqua of the lagoon itself. Really, once you hit location and accomodation, you don’t need too much more than that to go right to have a good time. None the less, there was more. I’m not a fan of Pacific cuisine (sorry to any of my island readers out there). A year in Melanesia didn’t overwhelm me with vibrant culinary experiences, so I was a little suspect at having to package all our meals in with the accomodation, and face the prospect of not getting to choose off a menu. But again, this was completely unnecessary. The food is great. A wide variety of styles- curries, fish, western, asian and Pacific- is on offer, with meals varying each night of the week, and a limited a-la-blackboard menu option at lunch time as well. The dishes themselves were nearly universally tasty, and the variety and volume left nothing to be desired. You do need to plan ahead a little, as meal-times are set and there aren’t stacks of between-meal options, but we had a little heap of biscuits with us that we never made it through, testament to being well fed. Communal eating didn’t really appeal at first (dinner takes place at shared tables- gasp! ), but the barefoot vibe of the place (and the travellers frequenting it) facilitates a really chilled-out opportunity to get to know people. Never a package-holiday traveller, I wasn’t particularly interested in the daily activities that the hotel lays on, but in fact they had some fantastic little trips available, of which we partook several. Snorkelling trips to explore other nearby reefs, sunset and drinks on the sandbar (we missed this one, sigh), a hike up to the island’s highest peak (beautiful views), and a handful of cultural visits as well were all on the menu. A must-do trip is to the Nacula Caves, which involves a series of swim-throughs of saltwater limestone caves at the top end of the island- not for the claustrophobic, but otherwise a unique and fantastic morning which everybody enjoyed. An aspect of the resort which we really appreciated was the attitude of the management. Run by Australasian expats, the management are accessible, friendly and helpful, and mingle easily with the guests. The local Fijian staff are warm, welcoming and hospitable, as well as being very professional. It’s the sort of place where you get to know the staff by name- and they you. More to the point, the resort prides itself on its links to the local communities on the island- something that we found especially important in terms of our own values in this area. As well as trips which incorporate, employ and interact with villagers, the resort runs a scholarship fund for students on the island to which cover costs of fees, uniforms and school supplies, as well as contribute to the maintainence of the school facilities. Guests are invited to contribute to the fund, and the resort will match dollar-for-dollar whatever is donated. There is a sense of respect and interaction between the resort and the village, which I hope the management will be able to maintain as the resort ages. I would be wrong not to return to the lovely reef. Quite aside from the access to a number of dive-sites in the area via the on-site dive-shop (do the shark dive), the snorkelling is, well, unlike any other beach snorkelling I’ve done. While I’ve seen a handful of reefs that are more vibrantly coloured close in to shore (but only a handful), the diversity and volume of fish-life was a delight, and never this accessible, anywhere. 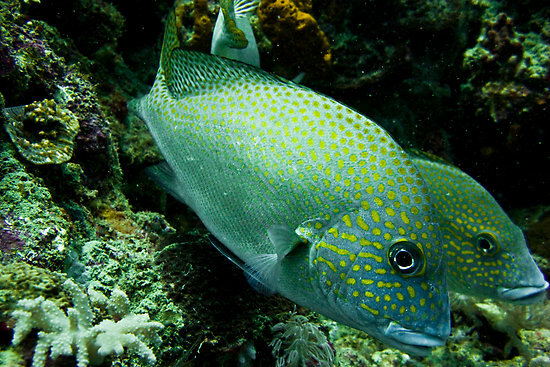 If I reel off a bunch from memory, there were Triggerfish, Moorish Idols, Parrotfish, Chromis, Anthias, Unicornfish, Sweetlips, Jackfish, Dascyllus, and a host of other reef favourites. The more special visitors included a shoal of Reef Squid, Stingrays, a huge Octopus and a metre-long Barracuda- all within 10 metres of the beach itself! The reef is accessible at high- and low-tide (and in fact the reef life differs at the two extremes, worth checking out), and more to the point it’s a joy to swim along; the channel provides a shallow sandy-floored passage that drops to a couple of metres in depth for a long way out into the lagoon and which is very comfortable to swim along, and the reef raises a wall along the southern edge of that passage where most of the action is. It’s a safe, enjoyable way to investigate the sea life, and we did it every day, and loved it. For sheer accessibility to a really exciting reef, this can’t be emphasised strongly enough. As I referenced in an earlier post, I proposed out at Blue Lagoon (and would have been hard-pressed to chose a better location for it). Before heading out, I dropped Kylie (one of the managers) a note letting her know my intentions and asking if there was anything a little special I could arrange with the hotel’s help. She was most supportive and immediately gave me a list of options, including a lobster dinner for two on the beach (away from the horde), and the option of having a picnic on a secluded private island nearby- both of which I seized upon and both of which were thoroughly enjoyed. Words of moderation? Well, a couple probably. First up, once you’re on the island, you can get away without paying much more, but the temptation will always be to do things and have drinks, and these will add up. You don’t use cash out there, everything gets recorded in a book and you pay up at the end, so if you’re not keeping track you could be in for a bit of a surprise- nothing (except some of the activities) is particularly cheap- although it’s not extortionate by resort standards either. That said, having food taken out of the equation is a pretty good thing, and we managed just fine with our bill. My biggest fear for Blue Lagoon is that as word gets out, the place will get a little overrun. The reviews on Trip Advisor are pretty rave, and with good reason- this is a very special place right now, and somewhere that we will never ever forget (not just because we got engaged out here). It’s been open less than a year. I’d love to think that the management will be able to maintain the relaxed vibe several years into operating with high demand and through-flow, but it’s not impossible to imagine it getting a bit worn-out, so I’d recommend getting in sooner rather than later. And, well, the cocktail list could probably be improved on. But really, when you’re four and a half hours from the mainland and everything has to come by boat, you can understand why these things might be a little lacking, if that’s your thing. All up, this was probably my best single hotel/resort experience, mixing a lovely blend of quality, relaxation, activities and experience, all at a very reasonable price. My hat goes off to the team running the place as they’ve created a really special location with a perfect unpretencious vibe. Great for travellers, flashpackers and families with a reasonable budget, this goes right to the top of my list of ‘places you should visit in the Pacific’. Accomodation- 5/5 Light, fresh, new and spacious. The open-air shower has to be experienced to be understood. A range of really pleasant options from budget through laid-back comfort, this isn’t the Denerau Hilton, but why would you want it to be? Ask for Garden Villa 11 and get sea views thrown in for free. Food- 4/5 Great taste, decent lunch options and a good range of evening meals, despite not having any control over the dinner menu. This would be a total win if there were more between-meal snack options and a wider range of drinks at the bar, but really, I’m just looking for things to quibble about because there’s really not much else to add balance. Location- 6/5 Amazing reef, gorgeous beach, sunsets and tropical vibe- this has to be one of the best-located resorts in the Pacific. What can I say to the Blue Lagoon’s detractors? Would you like the hotel moved a little to the left? Activities- 5/5 Relaxation is key here, and relaxation and swimming are free, but the creative options for daily activities mean that for those unable to entertain themselves still have an option to keep busy. Do the cave trip. 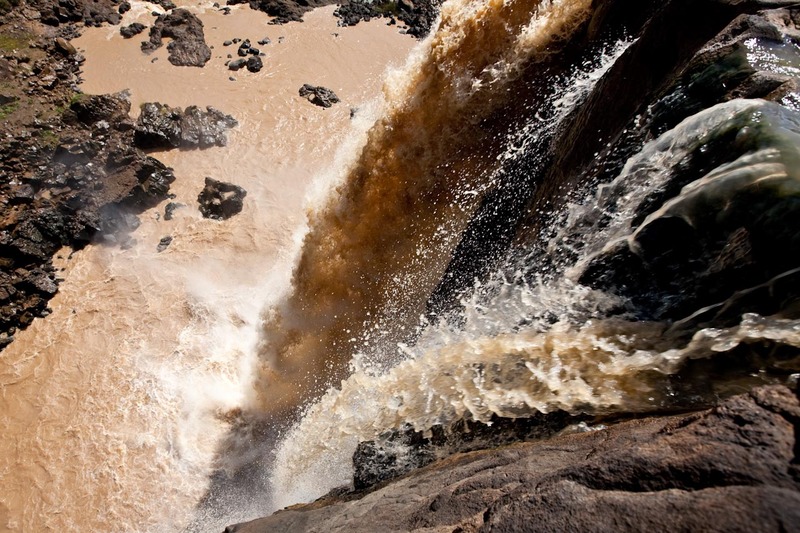 Not for adrenaline junkies- but hey, this is Fiji. If buzz is what you’re after, Queenstown is to the south. And there’s always the shark dive. Vibe- 5/5 Just brilliant. Beanbags in front of the open-front bar, barefoot dresscode, bonfires on the beach, and a general emphasis on chill-out throughout. And small enough to keep it personal. Really, really lovely. Management- 5/5 Friendly, accessible, helpful, flexible and professional. What more would you ask for? Ethics- 4/5 It’s refreshing to see a resort pay more than just lip-service to supporting local communities. It’s hard to know what impact a throughflow of western travellers will have on the island’s economy and environment, but the fact that they invest in local education is a great thing, and the friendly disposition of both local staff and local villagers we interacted with suggested that the attitude is more than just a marketing ploy for the time being. Value- 5/5 Value is an entirely subjective term. I appreciate every dollar we spent at Blue Lagoon and don’t have any regrets, as we came away with a set of beautiful memories and a great time. It’s not the cheapest option out there, but my word do you get what you pay for in terms of location and vibe. Blue Lagoon also gets an extra 5 points from me for that little extra something for laying on a really special time for us as we got engaged. Just fantastic. Thanks guys for an amazing stay. You can check the Blue Lagoon website here for tarrifs. All up, it means a mid-range stay option for two adults for a week comes in at around FJD 2,000, so if you couple that with a good flight deal from Australia, it can be quite accessible- though is by no means at the bottom end of the price scale. Worth every penny, in my opinion, but everyone values different things. About a year ago now (how time flies) I spent three weeks vacation in South East Asia. A few days I spent down on Railay Beach, in southern Thailand. I love Thailand- the beautiful lushness of the landscape, the warmth and courtesy of its people, the intense balance of flavours in its cuisine, and the clashing diversity of life in its capital Bangkok. The scenery around Ao Nang is spectacular. 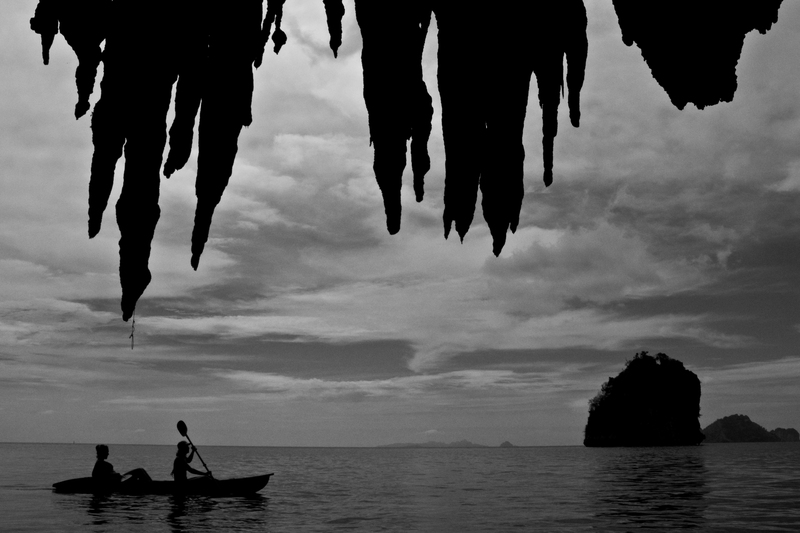 Railay is a peninsula but inaccessible from the mainland except by powered longtail boat, courtesy of a series of steep karst limestone hills hundreds of feet high which plunge with dramatic certainty straight down into the warm lapping seas. A mecca for climbers the world over, vast rockfaces hang above green-blue water, dripping with stalagtites. Tiny outcropping islands- made famous by and subsequently epynomous with James Bond following the release of The Man With the Golden Gun– stand like abandoned collonades amidst the currents, pocked with caves and begging exploration. This was my second trip to the south of Thailand, but my first to the western side of Thailand’s south. My first trip, back in 2002, took me to Koh Samet, a little further off the farang cattle track and frequented by Thais on weekend trips from Bangkok. 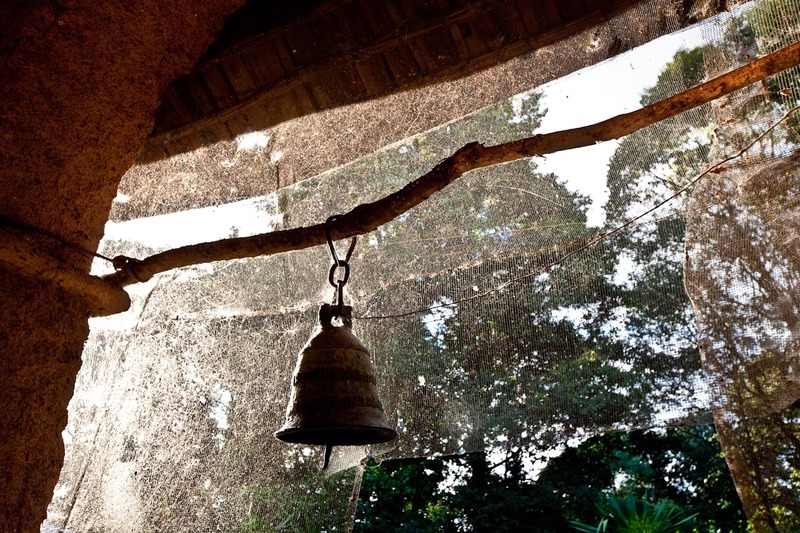 Koh Samet was overall a pleasant experience, during which I lived in a tree-house for five dollars a night. The island was laid back and relaxing, and the low point was being vomitted on by a kitten which had decided to share my mattress one night at four a.m.
Amazingly I showed enough self-control not to hurl said kitten from the tree-house. 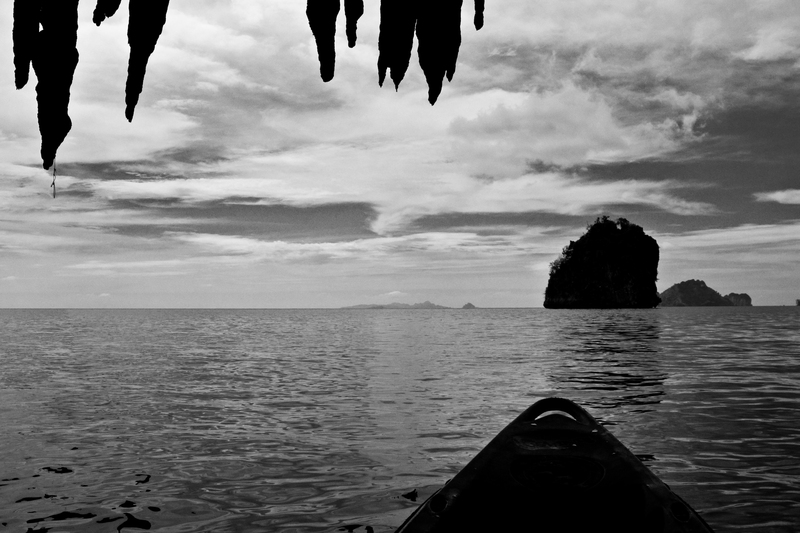 I was less enchanted by Railay Beach and Ao Nang. While the landscape was far more beautiful on the whole, the establishment of western tourism has left an ugly scar- not just in the hordes of blotchy white westerners who throng on the beaches, but in the attitudes of the Thais themselves. In vast contrast to the courteous attitude you find in Bangkok, or the warmth and generosity you find in the north, I found the people I ran into around Ao Nang to be brusque, uninterested and generally lacking in any charm, typified by the bellboy who tried to sell me weed within two minutes of my arriving at our hotel. However getting away from the crowds and onto the water (‘away’ assuming you could avoid being run down by a longtail), you could find some space to enjoy the landscape, so one morning Pam, Lori and I grabbed some kayaks and took ourselves for a paddle up the coast. We weren’t by any stretch of the imagination the only ones doing so, but it was nice to get intimate with the cliffs and caves of the little islands, and enjoy a slightly different vibe. The scenery was magnificent even if the light didn’t lend itself to photography (a little on the contrasty side with the reflections on the sea), and to see how Railay looks in more dramatic light, you’ll have to click here. All up, I wouldn’t go back to the southern beaches unless I happened to be in-country for something else and some friends were going down for a few days. While you’d be hard-pressed to find more exciting beachside scenery, the vibe and over-the-top tourist presence left me feeling a little flat. Compared to the peaceful hill-country around Chiang Rai, the frenetic pace and colours of Bangkok or the chilled-out stylings of Mae Hong Son, Ao Nang was a damp squib, and I think Thailand- and indeed South East Asia- has far more to offer than this particular corner of the peninsula. It’s no secret that I didn’t really love my time living in Papua New Guinea, for a variety of reasons. However the one thing that did make the place special were the weekends. 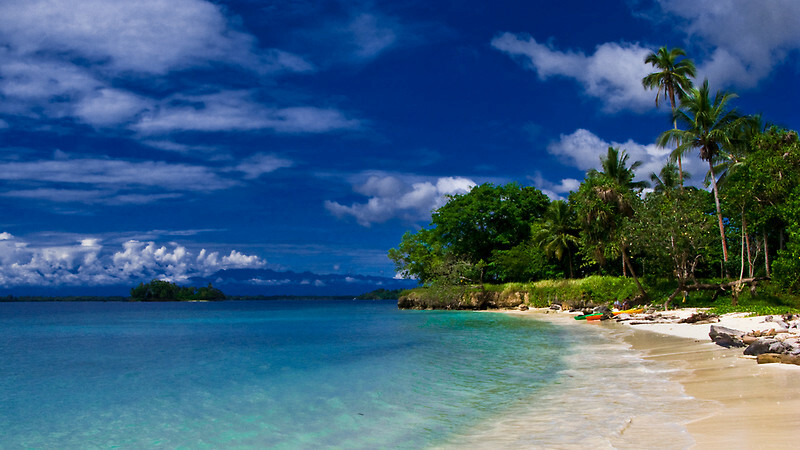 Saturday mornings we would jump onto Jan’s dive-boat and head out into Madang Harbour, easily one of the prettiest pieces of tropical real-estate in the Pacific. A large natural harbour surrounded by an outer reef wall many miles long, the harbour’s shallow waters are home to a diversity of marine life, not to mention interesting dive sites and historic wrecks. A smattering of islands can be reached within ten minutes of the jetty, among the prettiest, Wongat Island, a tiny little blob of rock, sand and palm-trees that would fit well inside a football stadium. I liked Wongat because it had perhaps the nicest sand beach in the harbour, and a lovely shallow run-out into the warm sea. The water stayed a balmy 29 degrees centigrade through most of the year, while shoals of colourful fish played among rock outcrops, which snorkellers could explore leisurely beneath a hot sun. I found this little outrigger (yeah, I know, it’s kind of familiar) bobbing around the corner from the main beach, tucked behind a few rocks. The shot itself was taken with my little Canon Powershot G9 (the same camera used for my underwater photography- Jan used the G9, and now has the G10, for his underwater shots as well), and to take the photo I held a pair of polarized sunglasses over the lens (as I couldn’t fit a polarizing filter over the front) to capture the clarity of water and contrast in the sky. The result was one of my favourite photographs from the year, and made my list of favourite photos. Coupled with the beauty of the environment it was taken in, this one’s a keeper for me. On a work assignment in Haiti, it was easy to see why Port-au-Prince was considered a bit of a no-go zone. Crime and the risk of kidnapping kept us behind coiled-wire barricades in hotels and using alternating routes to drive through the streets, while Brazilian blue-helmeted peacekeepers were stacked, fully armed, into the back of circulating pick-up trucks patrolling the streets. Favellas crammed the steep mountainsides that hemmed in the capital and overlooked the sprawling harbour, fragile and impoverished, and washed away by every passing cyclone. While the scenery was alluring and the people colourful, there was an intensity and oppression about the place that was quite invasive. The second half of the trip, however, was spent on the island of La Gonave, a half-hour flight by light aircraft off the coast. Peaceful, idyllic and eye-wateringly beautiful, the white rocks and rich green flora leant the place an air that suggested the Swiss Family Robinson could have settled well here. The people were friendly, the village streets safe to walk. The roads were horrendous but the beautiful landscape and diverse vegetation made the journeys worthwhile. Before catching our flight home, a colleague and I asked the driver to take a detour down to the coastline near the airstrip. In the tropical sun, clouds billowed over the mainland and the white coral beach was searing to look at. Within the reef, the water was still and quiet and bath-warm, translucent and quite magical. We walked a little way along the coastline, then went for a swim in the shallow sea. It was an absolute highlight of our time in the country, and a place that I hold in a special place in my memory.